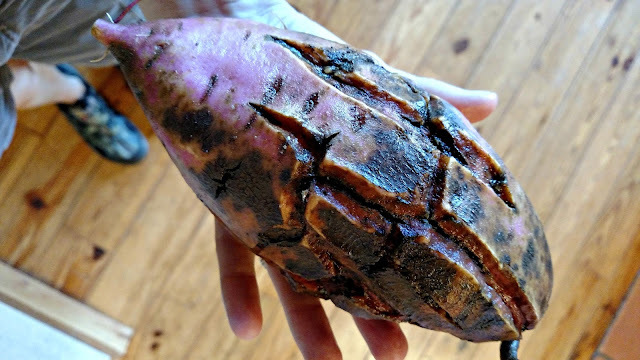 I loved baked sweet potatoes and often freeze them whole after baking them. This one is easy...they were grown at Two Bears Farm. Too much water too late in the season. I wonder if it's all the rain we got, especially since they are softening so quickly. Can they be canned? I've never grown sweet taters.....I wish I could help you. Goodness is that one big though?? They are old before their time! Halloween sweet potatoes. At least they are good, but gosh, how WEIRD. Looks like they got super ripe and burst open. If you find out, let us know. In the meantime, I am going to Google it. Be back if I find anything. I found the same thing all over the web. Here is the likely problem: How disappointing to find them cracked when you dug them. I am pretty sure the splitting can be blamed on our weather pattern of drought followed by a few days of heavy rains. The sweet potatoes most likely developed a hard, mature skin during the dry periods. Then when it rained, the roots and tubers swelled with new growth and ruptured the potatoes lengthwise. Yikes! I'm not sure. At least they taste good. We grew white potatoes. I love sweet potatoes, but I can't get the rest of my family to like them. I really like Tom's comment! I had a feeling it was too much water too late, and possibly I thought the temps may have played a part in it too. But lucky for you that you could still eat some of them! I've never grown any so I can't help you with that. They kinda look like they overheated and split like they were baked in the ground. My initial thought was too much rain. Wow, that thing does look weird! Bummer that they won't keep. But I sure would enjoy eating them while I could! I grow these for my husband and I can them every year. They have to be pressure canned. They work out very well. Taste way better than the canned from the store. How about slicing them for fries and then freezing? I have no idea either... but it is good that you could still use the inside of them. I am in a gardening club on facebook that people ask each other questions. Lots of knowledge there. If you want the link... let me know and I will get it for you. oh my..it looks like something coming out of the horror movie. I have zero knowledge on gardening..so I don't know what could it be..